Home / Horse Stories » Off Rye Grass and Winning Classes! 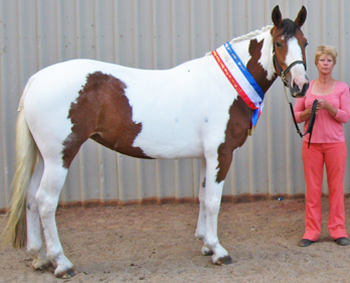 As a current member of the Horse Riding Clubs Association of Victoria (HRCAV) I'd like to thank Gotcha Equine for all their help as it has been invaluable to me. I'm just sorry I didn't hear about all this information before I had my Thoroughbred euthanised as he was on the same pasture. I'd like to share my story in the hope it can help another horse owner to shortcut the road I have been down with my mare as it was certainly no fun. As a matter of fact I was ready to give up on her. Meg was bought as an eight month old foal and as I'm a novice horse person I had a breaker handle her for a week on my property after which time I took over. She was absolutely gorgeous and extremely responsive to any teaching. It seemed as if she was just born to be mine and we bonded to such an extent when the time came to break her in at two years of age that I decided to do it myself (at fifty eight years old after learning to ride at a riding school at fifty). Meg was a breeze to work with even for a novice. I rode her on trails and in traffic with total confidence. Everybody who knew her raved about her placid nature. We moved to another property where she had lots of free range Rye Grass and both the horses and I thought it was wonderful. During this time I sent her off to be broken to harness and when she came home I turned her out. A couple of months later when I started to ride her I had a completely different horse. I realised she had issues from the harness breaking but even things she had taken in her stride as yearling and onward she became a nervous wreck about. I put her on vitamin B and other multivitamins to no avail. I confined myself to riding in the arena as I could not trust her out on the trail or in traffic any more. I had my horse masseur to her and he was shocked that she was so tense as he had been manipulating her for some time and had not seen her behaviour that bad. He said her lymph glands were toxic and swollen and she needed a vet to detox her. The next day my farrier was there to do her feet and also commented on her changed behaviour as she had always been great to shoe but as soon as I left to get his coffee she went into a stress attack. He told me about one of his horses who could not be left on grass or it went feral. He suggested I lock her up off the grass and only feed her hay, which I did immediately, also giving her some vitamins and salt to wash out the toxins. I saw the improvement in three days. Even my instructor commented that she seemed to be listening and understanding and I was able to ride her past objects and through things which I couldn't get her near before! I had taken her off the Rye Grass on the 15th of February and as the days went on I could see the nervousness improving as well as her coat. Her very dry, coarse coat came out and her new coat is back to soft and shining. I decided to take her out to the Clydie Cross show for an outing to see if her behaviour had improved when she was out as well. My husband accompanied me as he was a bit worried in case she was not as relaxed as she appeared at home! 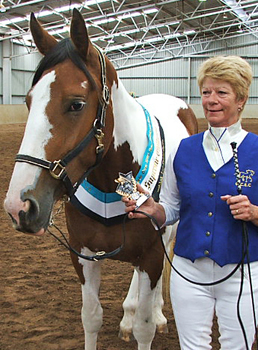 As you can see by the photograph she shocked us all by not only behaving like an angel but won Champion Led Filly and then took out Supreme Champion Led of the show over all the other stallions, mares and geldings at only four years of age! I must say I was in shock as I can't even win a chicken raffle. I had lots of comments on how gorgeous she was and her calm attitude on such a windy day. I had booked some time before to go to a clinic with an instructor from Germany as an onlooker as I felt I couldn't ride and listen if she became uptight. When I saw her improving before my eyes I was so disappointed I wasn't taking her, I tried to get her in but it was too late. My Chaff Chat magazine arrived the same day I had my farrier out and I couldn't believe my eyes when I saw an article in it about grass related problems! I had never heard about it before and now twice in one day! I was on the phone to Gotcha Equine like a shot! I have found even the hay I was feeding her wasn't doing her any good, but now she is on the Gotcha Feed Plan and I can see the improvement daily. I get very excited now I can see the old Meg I trusted returning slowly. Meg has been only three weeks into her new schedule and last weekend I took her to a Franklin Leviston clinic and in two days she had improved so much that everybody at the clinic was amazed including Franklin. He has asked me to write a testimony for him to put in his news! So we are not completely out of the woods yet but I am so excited as I can see the light at the end of the tunnel. Alison Stavenuiter - Highton, Victoria.